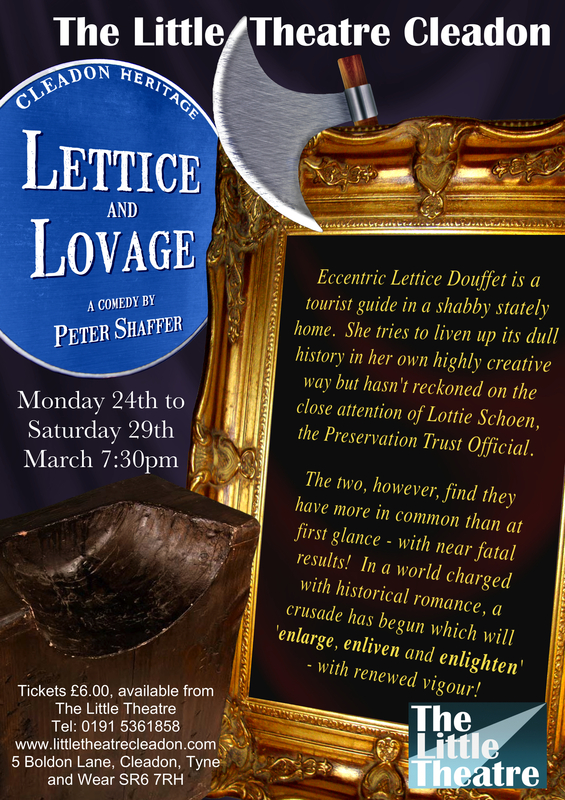 The upcoming March production is Lettice and Lovage by Peter Shaffer the well known author who is best known for “Equus” and “Amadeus”. Eccentric Lettice Douffet is a tourist guide in a shabby stately home. She tries to liven up its dull history in her own highly creative way but hasn’t reckoned on the attention of Lottie Schoen, the Preservation Trust Official. The two, however, find they have more in common than at first glance – with near fatal results! In a world charged with historical romance, a crusade has begun which will “enlarge, enliven and enlighten” – with renewed vigour! The play takes place at 3 separate settings – Fustian House (an ancient Elizabethan mansion), then a London office and finally a basement flat . You will understand that on our tiny stage it would have been impossible to achieve this and so the decision was made that, rather than not tackle a challenging task at all, we should perform it “in the round” where you, the audience, are asked to imagine the various settings – I hope you will be able to do so and that you can appreciate the reason for abandoning the proscenium format. I am very fortunate in having had available for this production two of the Clubs most experienced actors in Sonia McDonnell and Denise Wilson – they have both been a joy to direct. We have been able to introduce some newcomers and I welcome to their first formal production Ann Owens, Mary Ord and Stephen Jobson. We also have Doreen Shannon and Stan Dix – both last seen last seen in “The Odd Couple” as Vera and Manolo – very different roles to that of the timid Miss Framer and testy Mr Bardolph!